A little hand clutched a soccer ball made out of old t-shirts. Amongst the bleating goats, two bare feet stood in the middle of the desert, Mehdi Jaghuri’s playground, central Afghanistan. Thirsty, Mehdi and his companions exchanged cheeky smiles as they kicked the ball around. Dust and rocks flung mid air producing near misses, while the boys did their best to dodge unwanted injury and brave the summer heat, reaching up to 50 degrees. The goats joined in, ramming each other, providing endless entertainment, temporarily erasing shadows of the surrounding world. Mehdi jumped on an old tyer, while friends pushed it along with a sturdy stick over the unforgiving, dry terrain against the backdrop of saw-toothed mountains. The landlocked village of Acha in Jaghori, Hazarajat, was a place where imagination ran wild. A war zone, Mehdi’s childhood was a balancing act, preparing him to never underestimate the power of his own imagination. Fine arts student Mehdi Jaghuri, 22, often repeats his famous words “the world is sick and I am sick of the whole world,” while painting. Picture: Corinna Harris. Inside a Melbourne art studio an animated face examined the unfinished self-portrait. Fine arts student Mehdi, 22, traced his childhood memories of war in red brush strokes. An unusual peaceful energy oozed from his chest as he painted the pain away. “Painting helps me mentally and physically. It makes me feel healthier. I am releasing something from my body and placing it onto something else. Painting is meditation,” Mehdi said. Mehdi Jaghuri draws on reoccurring dreams to inspire his next artwork. He is never short of ideas. Picture: Corinna Harris. Like Mehdi, who arrived in Australia in 2005, creating art was therapeutic for many victims of trauma, including refugees. Melbourne arts therapist Nyrelle Bade said arts therapy allowed the discharge of strong emotions and a release of unexpressed energy that was not exercised during the event due to fear, granting power over suffering and the ability to reframe their experiences. “Art is a powerful medium for children who often don’t have the vocabulary to express the impact of the tragedy, catastrophe or dehumanising aspects of trauma. Through art children can externalise their experience and it can provide them with a voice,” Nyrelle said. A six-year-old shepherd gently pushed a stubborn donkey left and right and left again. Bleating lambs leaped over each other, dissolving before the towering mountain peaks rising out from the desert. Mehdi searched through white woolen clouds for Donkey’s baby. He cradled it as its mother and the rest of the herd followed him on a usual 10-hour journey over steep terrain. His eyes traced small shadows in the sky that danced in a northerly direction. The sun was high, 12 o’clock noon. “Someone in Australia asked me the other day what the time was. I looked up to the sun and said it’s 4.30 pm. My friend looked at me as if I was crazy,” Mehdi laughed. Every minute of each journey was filled with fear. Sometimes the boys and animals hid in mud houses to escape the heat or the Pashtuns. Survival was a lottery. “You are just running around at that age trying not to think about the darkness,” Mehdi said. The shepherds raced to the village to the back of the hill after the strenuous journey, washing off the sweat and dipping their blistered feet into the cool lake. Looking down at his fingers, stained in red and white oil paint, Mehdi thought of his father’s 12 day boat trip with a crumbling engine that broke down four times. For seven years Mehdi and his family were in the dark about dad’s survival upon reaching Australia in 1998. “A lot of tears went into that journey, a lot of broken hearts. People were broken, people went crazy,” Mehdi’s said. His father worked as a farmer before deciding to flee the country in order to create a future free from persecution for the family. “Parents are the people who lift you up, teach you how to speak and tell you who you are,” Mehdi said. In Acha where everyone kept close to their families, six cubic mud houses shielded the livestock contained on the ground level, whilst the people lived on top. It was dinnertime. Just in time for two hours of lantern light, Mehdi’s three younger brothers and two older sisters sat cross-legged rolling bread and yoghurt into a ball and dipping it in the oil. In the early 2000’s, the father’s daily routine consisted of regular walks from Dandenong to Pakenham where he desperately went from factory to factory, hunting for work. Each night Mehdi’s father watched the news to learn English, repeating words after the anchor. Sometime later, Mehdi’s father lied motionless in a Melbourne hospital bed, in intensive care, after an accident in the factory where he worked as a butcher. As the doctor entered his room, the sense of the impending doom flooded him. He was told his back operation was unsuccessful. Four years passed. Mehdi’s family glided through the air as their plane made its descent towards the land down under, while the father patiently waited at arrivals. “When I saw him again all the memories flooded back. I know you, I know your face,” Mehdi said. Mehdi stared wide-eyed at a thousand lights from inside the car. The fickle spring wind whispered to Mehdi through the window. In the darkness, he felt he was in a dream, where brightly lit giants disguised as skyscrapers, touched the moon. Reaching home, objects around him had an almost ethereal appearance. “What is that sound? What is that green thing? What is the house made of? Is that wood?” Mehdi gasped. The intense excitement of the first few weeks at school slowly fizzled as classroom tormentors carried out daily racial taunts, sticking their feet out in front of Mehdi to trip him. English was no longer cryptic after six months and Mehdi’s will power grew stronger. He entered the schoolyard every day grinning from ear to ear. “If I feel sick here I don’t take any medication. I just go for a long walk and laugh, laugh, laugh and forget I was sick,” he said. Failing art in high school didn’t quash Mehdi’s spirit. 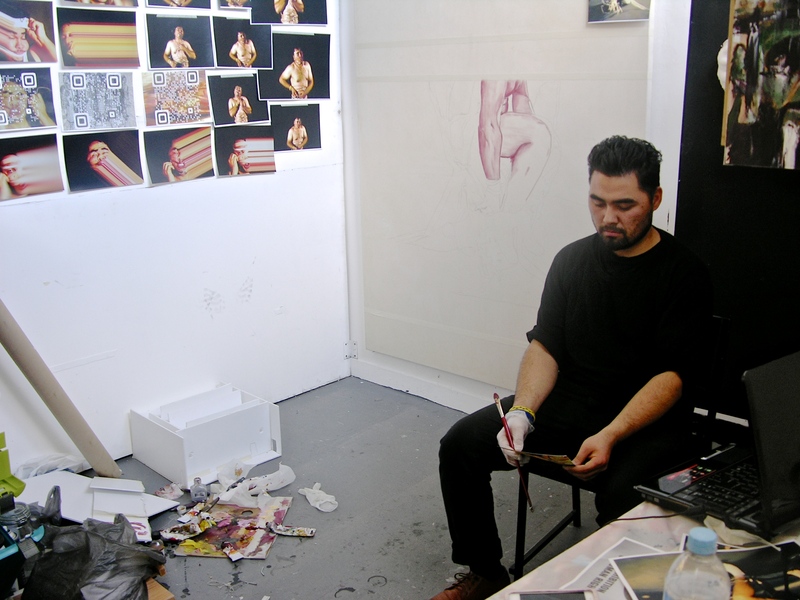 After graduating from college and entering Victorian University to study fine arts, Mehdi won numerous art prizes, including the Heartlands Refugee Art Prize. Mehdi never put down his paintbrush. 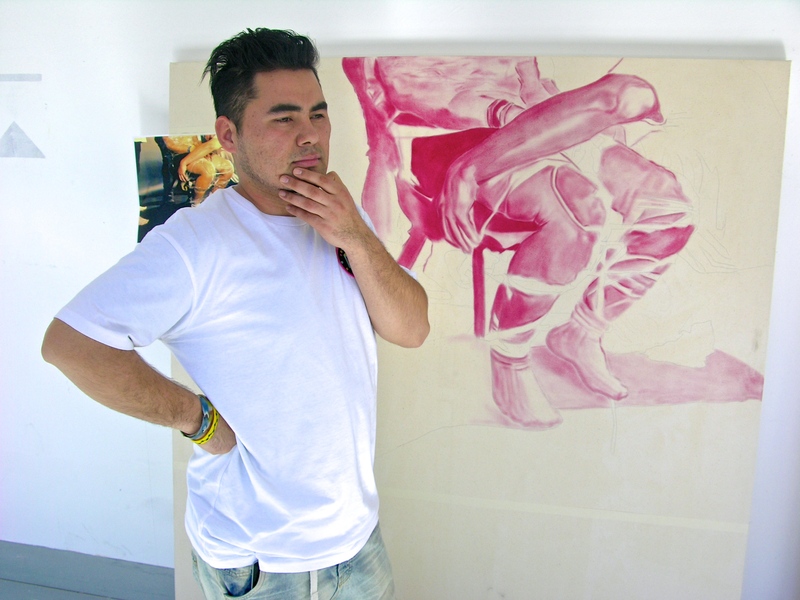 His artworks preserved Hazara’s identity, as the culture was without a home. His pain produced confronting, real and tangible images bringing to life the agony of asylum seekers, tragedy of war and humanity and the persecution of the Hazara people. “My dream is to bring change in humanity, to bring love back into life, to remove the hate out of our system, to show these torturing, dark images to make us realise that we are human and part of a family,” he said. Mehdi’s imagination was stronger than knowledge, his dreams more powerful than facts. He believed laughter was medicine and love was stronger than death. The mountains’ gaping jaws couldn’t swallow his creative spirit. Surrounded by 4800 artworks, the aspiring artist had found his sanctuary, containing his childhood, identity and life. Mehdi says painting enables him to forget the horrors of his past. Picture: Corinna Harris.